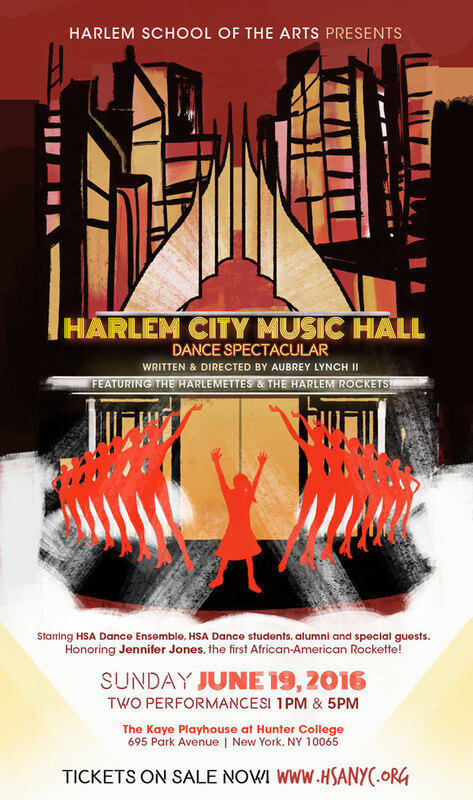 HSA Dance is pleased to present Harlem City Musical Hall Dance Spectacular featuring The Harlemettes and The Harlem Rockets. Written, directed and choreographed by HSA Dance Director Aubrey Lynch II, the show introduces Little JJ who has a dream of becoming a Rockette. In order to fulfill her dream, however, she must first embark on a journey to find the legendary Harlem City Music Hall, and its infamous Hall of Wishes. Bewitched by self-determination, Little JJ leads her friends on a bold quest to find the magical auditorium. Where dreams come true, danger lies! Harlem City Musical Hall Dance Spectacular will honor Jennifer Jones, the first African-American Rockette. Get your tickets today! All guests must have a physical ticket to enter The Kaye Playhouse. All will-call tickets must be picked up at the front desk of the main building. Support HSA Theatre Department and bring a friend!